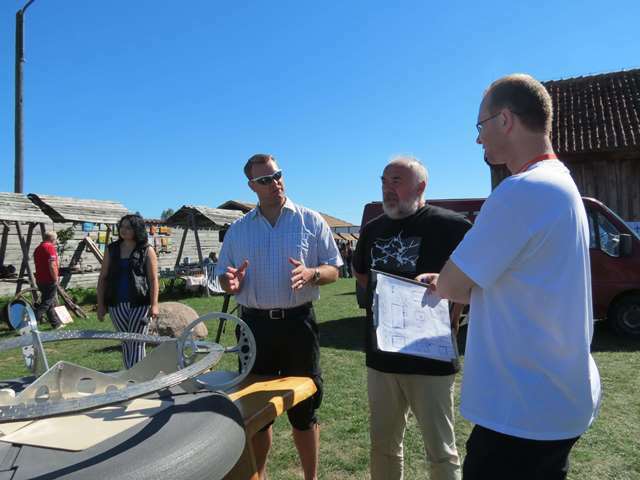 On Saturday 7 September 2013 the Möbius Maglev Train science show visited Nidzica, two hours north of Warsaw, Poland. The occasion was a science picnic organized by the local NIDA Foundation. 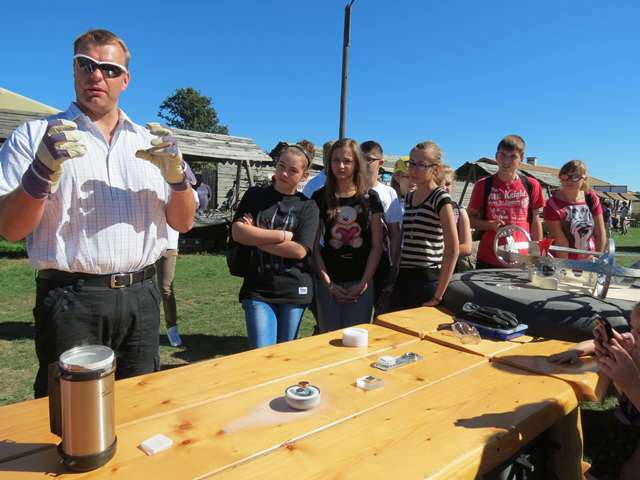 Vegard Stornes Farstad from SRD explains quantum levitation of magnets above superconductors (note the different setups on the table) during the science picnic at Garncarska Wioska near Nidzica. Photo courtesy of Gazeta Olsztynska. 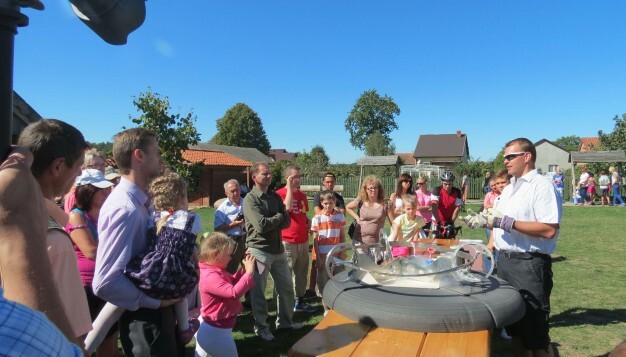 Parents and children of all ages showed up and visited the different exhibitions at the picnic, with the Möbius Maglev show as the centerpiece. 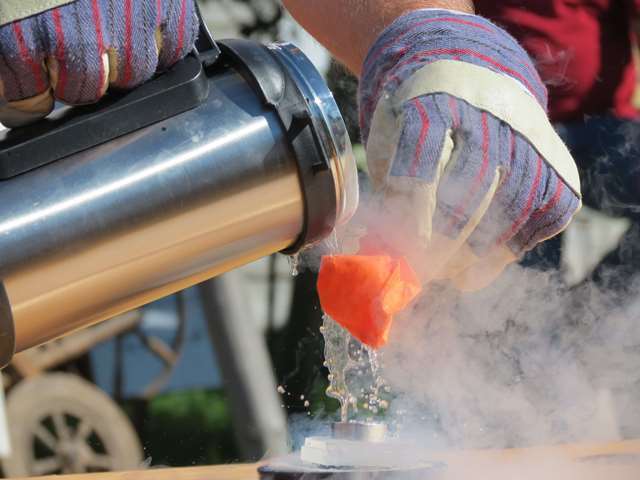 In addition to the physics of superconductivity and magnetic levitation itself, it was important to explain the safety precautions when working with liquid nitrogen and superstrong magnets, with suitable demonstrations using balloons and metal objects. Vegard Stornes Farstad from SRD during the science picnic at Garncarska Wioska near Nidzica, demonstrating the extreme coldness of liquid nitrogen by cooling a balloon until the air inside becomes liquid, making the balloon shrink dramatically. Photo courtesy of Gazeta Olsztynska. Before we could stop him, one unfortunate visitor that wanted to test the strength of the magnets, decided to put his mobile phone on the magnetic track… Indeed it was hard to pull the phone away from the grip of the magnets, but this “experiment” also proved that our warnings are not just for fun; the mobile phone did not work afterwards, and we do not know whether it was possible to make it work again. Aside from this unfortunate incident, however, everybody enjoyed a lovely day and the excitement of quantum levitation in all directions. The audience saw large magnets levitating above superconductors, ultrathin superconductor plates levitating very high above magnets and the superconducting train flying around the Möbius Maglev Track. Vegard Stornes Farstad from SRD and Krzysztof Margol from NIDA discussing the science picnic at Garncarska Wioska near Nidzica. Photo courtesy of Gazeta Olsztynska. Thank you very, very much on behalf of so many people for arrival and a fantastic show. We wish to book the Möbius show right away for the first Saturday of September 2014, please reserve this date. The reactions and interactions that I received on and after Saturday are fantastic. You can see the photo galleries on the website of the Olsztyn newspaper, we are waiting for the printed version. Sensational show and presentation, perhaps indeed the huge interest on Saturday can actually inspire somebody to become a “little Einstein”. Artikkelen ble skrevet den 25/09/2013, i kategorien Aktiviteter.